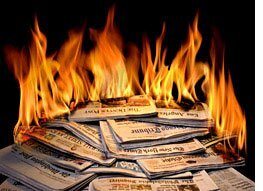 Two great articles today about the dangers of government getting too involved in the newspaper business as the industry experiences serious marketplace difficulties. Slate’s Jack Shafer (“Saving Newspapers From Their Saviors“) and Mark Hopkins of Silicon Angle (“Obama Administration ‘Open’ to State Run Newspapers“) both raise concerns about President Obama’s recent comments hinting that he is open to legislation that might grant struggling news organizations tax breaks if they were to restructure as nonprofit businesses. In a piece for the City Journal back in March entitled “Socializing Media in Order to Save It,” I discussed the specific proposal in question, Senator Benjamin L. Cardin’s (D-MD) bill, S. 673, the “Newspaper Revitalization Act,” which would allow newspapers to become nonprofit organizations in an effort to help them stay afloat. Importantly, however, the measure would also disallow political endorsements on their editorial pages as part of the deal. In my essay, I pointed out how “If the FCC received grant-making authority to dole out subsidies to media operators… it’s hard to imagine how journalists won’t be expected to surrender something in exchange.” And that something would be their journalistic independence. [I]sn’t journalism supposed to be the lauded and independent “Fourth Estate,” free of bias and loyalty to any governmental institution? Obviously, bias is pervasive in the old Heritage Media, but assigning journalism governmental overlords will almost ensure that journalistic independence will end. A bailout is the only hope of continued existence for the majority of newspapers, since almost without exception they’re too proud or ignorant to fundamentally change the way their organizations operate to adapt to the new media ecosystem. If one examines the extent to which the government has structured their relationships with the large banking institutions and the automakers, it isn’t a great leap of logic to see how the interference will play out with newspapers (and who would be more aware of that than the journalists that have covered those stories?). Indeed, the fact that the Cardin bill already proposes a prohibition on political editorializing doesn’t bode well for what the future might hold should government ride in to rescue some struggling papers. What else might newspapers have to entertain? Free ads for politicians? A Fairness Doctrine or mandatory right of reply for printed editorials? Censorship for hard-hitting political satire or comics? Who knows, but it is impossible for me to believe that lawmakers won’t ask for something in return for bailing out news outlets. The government’s attempt to prop up newspapers with rewrites of the tax code or Sarkozy-esque direct subsidies of government advertising and free subscriptions for young people interferes with the already-in-progress transition from print to digital news delivery that’s been accelerating for the past 15 years—or longer. Propping up troubled papers has a cost. It weakens the enterprises that are rising from below to compete with them to deliver advertising and, yes, deliver news. I can think of no better way to hinder the rise of such Web sensations as Politico and Talking Points Memo than rewriting the rules to benefit newspapers. Great point. Any way you cut it, federal meddling with the news business — even in the name of saving some traditional journalistic outlets — will likely have serious unintended consequences in the long run. President Obama should just say no to newspaper bailouts.